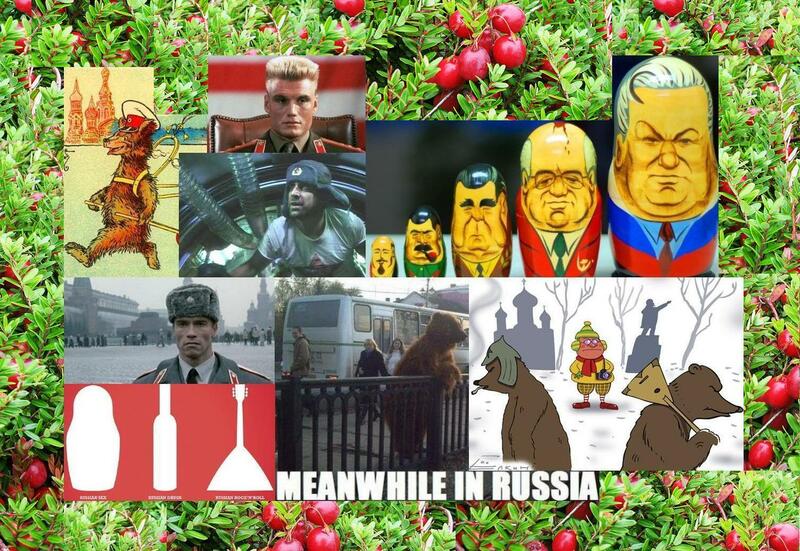 Russian Stereotypes: Western Perception of Russia as seen through Russian’s eyes. Part II. Ivan Bilibin, Illustration to the “Frog Princess (Tsarevna Frog)” . It should be noted here that by ‘Western popular culture’ I mean mainly klyukvified* films which I see as a height of evolution of stereotypical Russian narrative in the West. This post doesn’t deconstruct the Russian stereotypes in Western (American) films in detail. There are too many of these films and it will take not a post but a book for me to cover only some of them. My aim is also to reveal generalized characteristics of Russian men’ images in the Western cinema. I’ll devote a separate post to the view of Russian women in the West. The image of Russia in contemporary Western world is to a big degree shaped by the popular culture and is articulated in films, books, songs/music videos, ads and caricatures. 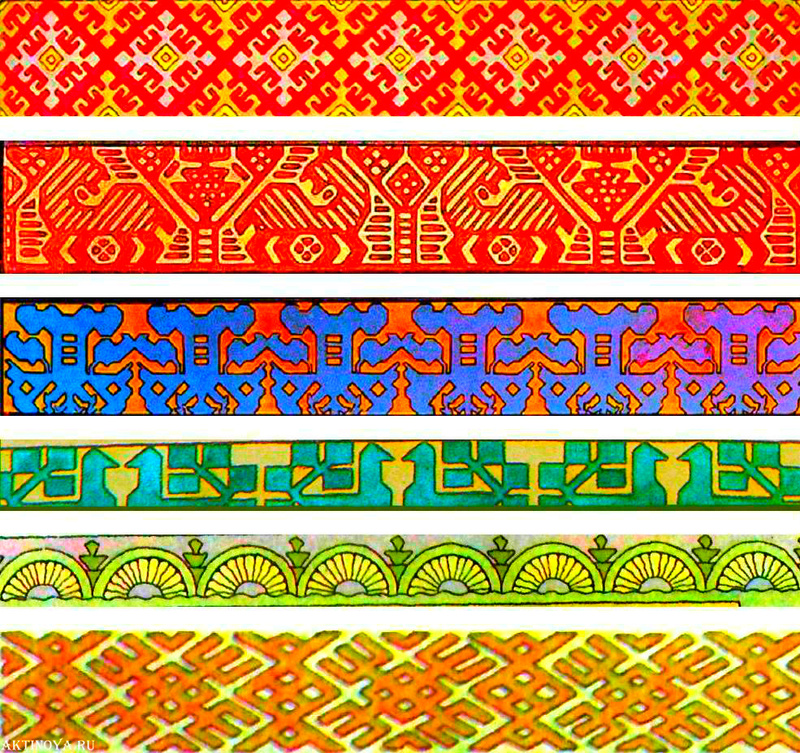 Since the Cold War era (and earlier) cultural propaganda in the form of mass culture products helped to fix the image of Russia and Russians in the ways shown below. 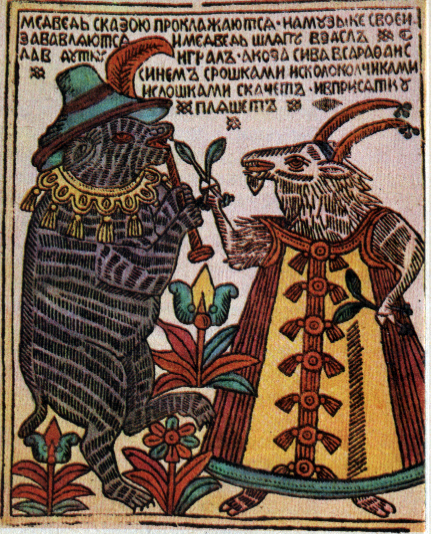 Russian 18th century lubok depicting a bear and a nanny-goat. Thus, ‘klyukva’ is a word used to describe a combination of foreign cultural, historical, linguistic and lifestyle stereotypes about Russia(ns) and lubok-like depiction of Russia(ns): bears, izbas, Cossacks, matryoshkas, babushkas, balalaikas, garmoshkas, kalinka-malinka, ushankas, samovars, vodka, borscht, caviar, banya, communism, endless winter and other ‘brands’. In other words, these elements themselves aren’t ‘klyukva’ but when they come together or when it’s simply too much of them, the film in which they appear can be defined as klyukvified. So klyukvification is a process of creating a peculiar stereotypical narrative using Russian cultural objects and concepts in a certain manner (exaggeration, putting them in a different context, etc.). 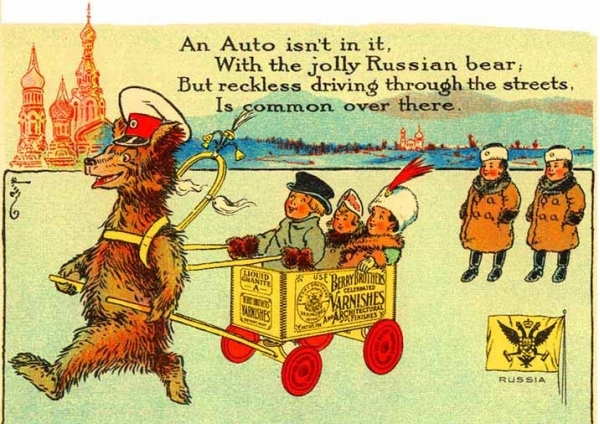 Here are some examples of high concentration klyukva: bears playing balalaikas in the winter streets of a ‘typical’ Russian city; tovarishchs in ushankas eating borscht/caviar and drinking vodka, saying “na zdorov’ye”; babushkas in Russian shawls drinking tea from a samovar in front of a row of matryoshkas, etc. It is important to note that klyukva is not necessarily negative towards Russia. Old ‘high concentration klyukva’ ad. Intentional klyukva can be dividied into two main kinds: otherization klyukva (e.g., for propaganda purposes – forming the image of the odd and dangerous Other) and pseudo-klyukva (for comical effect). Speaking of pseudo-klyukva and intentional klyukva, you can watch a short Russian parody of American movies portraying Russians (with captions) where many of the abovementioned klyukva ‘brands’ are presented. 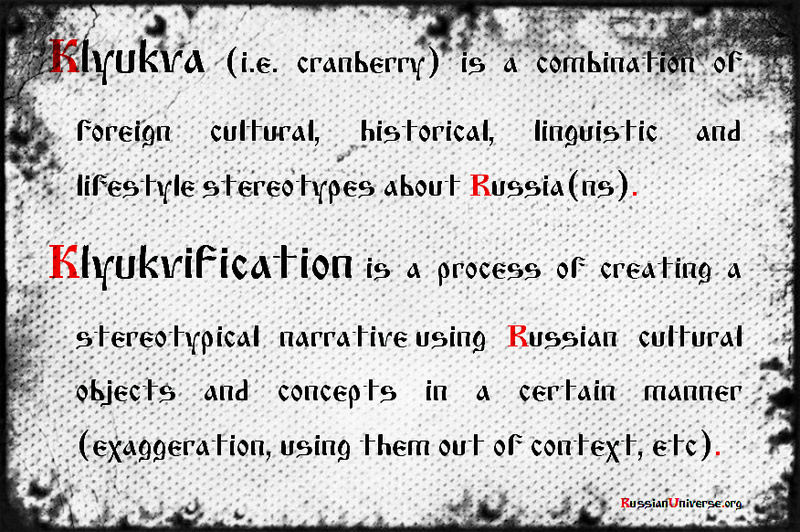 Some forms of mystification or vilification narrative of Russia (see the previous post) can be viewed as klyukva. Moreover, there is native klyukva which is made by Russian creators (and/or with a Western partnership) for the Western market to monetize existing Russian stereotypes. Klyukva sells! The so-called ‘borschploitation‘ films (from ‘borscht’ + ‘exploitation‘; cf. blaxploitation) can also be regarded as a type of klyukva. The travelogue which influence was crucial in shaping the current Russian stereotypical narrative in the West was “La Russie en 1839” by Astolphe de Custine. The approaches and angles of view presented in this book remain widely used to this day with little necessary changes. A…many of these parvenus of civilization have kept a bearskin [sic!] beneath their modern elegance, simply turning it inside out: You have only to scratch  the surface for the fur to appear and bristle. Custine’s book was first published in 1843 and immediately became very popular in the West. Some reasons behind its popularity were in the then-current political situation in Europe which was a fertile soil for the seed of vilification narrative of Russia. Paul Sanders, a historian and management scholar, points out that what makes Marquis de Custine’s work unique is its enormous impact on the Western perception of Russia long after Custine was dead, during the Cold War and so far. With that being said, it wasn’t a big surprise for me to know that Zbigniew Brzezinski (in his annotation to the 1987 US edition of the book) praised “La Russie en 1839” for the “insights into the Russian character and the Byzantine nature of Russian political system”. One of the reasons why I mentioned Carroll’s diary here was a supposition that his trip to Russia inspired him to write “Through the Looking-Glass”. Whether this supposition is true or not, it should be stated that portrayal of Russia as ‘another dimension’, Wonderland, etc., is the basis of klyukva (as well as mystification and/or vilification) narrative. Among the manifestations of these narratives in contemporary popular culture are the so-called ‘Russian reversals’, popular in the West jokes about Russia which mock it as ‘the land of antipodes‘, the Unworld . They were first introduced by Yakov Smirnoff – a comedian who immigrated to the USA from the USSR. The joke is based on a simple formula: in America you [verb] [noun], in (Soviet) Russia [noun] [verb]s you, e.g. 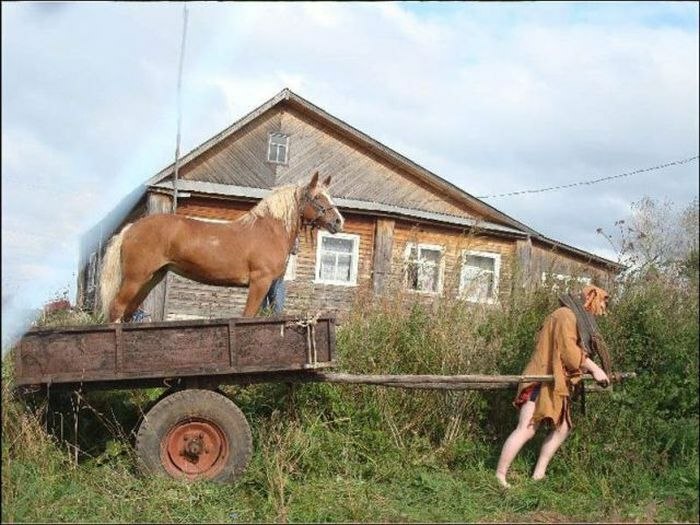 – in America you ride a horse, in Soviet Russia horse rides you. One of the most important and effective in promoting stereotypes kind of popular culture is cinema. It was Western films (various action, crime and comedy films, etc.) where stereotypes about Russia were vividly portrayed and became a part of contemporary Russian narrative in the West: from films like “From Russia With Love” (and many other Bond films), “Red Heat”, “Red Scorpio”, “Rambo 3”, “Police Academy: Mission to Moscow”, to “Armageddon”, “Hitman” and “Iron Man 2”, and the list goes on. In other words, ‘bad Rusky‘ is an image of a Russian villain. Particular types of this image are often represented by ‘Russian criminals’, gangsters who are part of Russian mafia. The types can vary from a dumb street goon (‘byk‘) to ‘avtoritet’/’vor v zakone’ (literally: thief-in-law), i.e. ‘Don’ or head of the criminal organization. Sometimes ‘Russian threat’ in the Western cinema takes form of a ‘terrorist organization’ (“Air Force One”, 1997). Another subtype of this stereotypical image can be called ‘smart and evil Rusky‘: e.g., Russian scientist (like a character played by Mickey Rourke in “Iron Man 2”), spy or hacker. 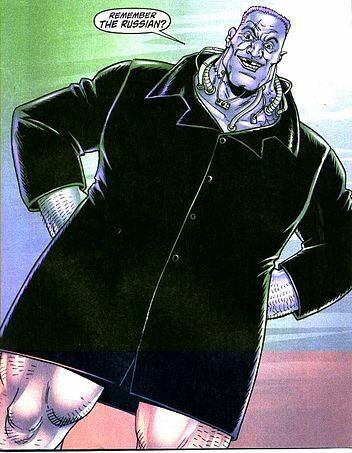 The Russian, a Marvel Comics supervillain character. The ‘drinking Rusky‘ character shows us a type of dysfunctional, good-for-nothing Russian who can’t compete with his passion for alcohol – vodka. Contrary to ‘bad Russian’ who is an embodiment of ‘Russian threat’, this character type possesses no or very few ‘dangerous features’ having a clear comic background (e.g., see high concentration klyukva ‘masterpiece’ “Police Academy: Mission to Moscow”). The ‘crazy (abnormal) Rusky’ character type name is a bit tautological because images of ‘Russians’ are mostly constructed as ‘naturally and inherently abnormal’ in the dominant Western cinematic discourse: ‘they are not like us‘, ‘they are different‘. Thus, this superbroad category includes both delinquents of ‘bad Rusky’ type and ‘Russian drunkards’ as well. It’s very funny to watch a ‘serious’ Western film based on a Russian classical novel (“Onegin”, 1999) where the characters of the first quarter of the 19th century sing a mid-20th century Russian song. In the film Lensky and Olga sing “Oh, the Snowball Tree is in Blossom” (“Oi, tsvetyot kalina”) which is actually Isaak Dunaevsky‘s 1949 song. It’s like heroes of an ‘authentic’ film based on a Charles Dickens novel singing “Yellow Submarine”. Such unintentional klyukva in films makes them closer to a blatant parody like the 1975 Woody Allen’s film “Love and Death“. Speaking of Western film adaptations of Russian classical novels in general, I would prefer to see a Western film based on a Russian novel  rather than a poor attempt to show ‘authentic’ Russia(ns) in a certain historical period (attention! klyukva danger zone!). The names of the streets, cities and other things written in Cyrillic alphabet are ‘on point’ in American films. An English equivalent would probably look like: ‘Weryvell Sity’ and ‘Sufrokare ovenu’. The surnames and names of ‘Russians’ in many films are weird, uncommon among Russians or not Russian at all: for example, General Gogol who is the head of the KGB in many Bond films. Gogol is a very popular male surname in Russia (not really but who cares, right?). To understand it better just imagine a Russian film where the name of the head of the CIA is… Shakespeare. Klyukva, indeed. Jason Bourne’s name (“The Bourne Supremacy”) in his Russian passport was written as “Лштшфум Ащьф“. It became a running joke in Russia because to an eye of a Russian-speaking person it looks exactly like “Rbybftd Ajvf”  would look in an American passport to an English-speaking person. Nice day, Rbybftd Ajvf, isn’t it? What a beautiful and not suspicious name you have! The common attribute of almost all Russian character types in Western films and popular culture in general is that essentialized ‘Russianness‘ is revealed through exaggeration and, finally, deviance. The preferred facial features of actors portraying Russians are, as we call such type of faces in Russia, ‘cut out with an axe’ (rough), their hairstyle is very short (or head can be completely shaved). Russianness of a character is often emphasized by exterior elements like ushanka (worn even inside a room which is actually viewed as impolite in Russian tradition), bottle of vodka, balalaika, telnyashka and the like. Russians are shown as self-contradictory, paradoxical, hyperemotional or self-controlled. When Russians are portrayed as calm, unemotional and strong-willed (like Dolph Lindgren’s Ivan Drago in “Rocky 4” or Arnold Schwarzenegger’s Ivan Danko in “Red Heat”) these characters remind of non-humans, robots or ‘automatons’ (how Custine called Russians). ‘Bad Ruskys’ and other Russian negative generalized images represent not just people who happened to be born in a certain country and speak a certain language, and who chose a bad path in life. They are embodiments of totalitarianism, barbarity, aggression, addiction and other evils representing the Enemy, the Other. Of course, not every Russian character in a Western film falls in the ‘bad Rusky’ or other negative category. Very often the character is simply klyukvified either on purpose or unintentionally. Sometimes s/he can can be relatively positive like the superklyukvified cosmonaut (i.e. astronaut) Lev Andropov (why not Lev Brezhnev?!) 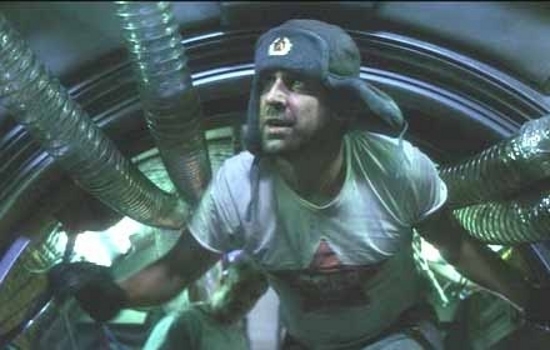 character in the Armageddon film with his ushanka on and looking like he has already drunk a bottle of vodka. Thus, popular culture and cinema in particular exploits existing stereotypes. It uses them in constructing generalized stereotypical narratives which are intuitively comprehensible and immediately understood by the Western (and global) general public. So Russian stereotypes aren’t unique in that sense: there are ‘Oriental’ stereotypes, etc. The former are very viable, mutating and transforming along with current trends in Western political, intellectual and cultural discourse, and still staying true to their dual mystification/vilification conceptual core. One can’t demand ‘authenticity’ in representation of Russia(ns) from such popular films simply because being manifested in a coherent visual form they are part of a bigger klyukvifiedpicture. Russian character types feed the sense of ‘civilizational superiority’ reinforcing the we-all-know-this-is-how-it-is-in-reality discourse. Stereotypes are a form of self-fulfilling prophecy, cognitive Ouroboros, backed by confirmation bias, so a person can’t get rid of them completely even when s/he wants. They form a perceptual and comprehending net thrown over the ‘world’ using which a person understands/forms the ‘reality’ for him/herself. So to put it simple – if this ‘net’ was made to catch ‘Russian bears with bottles of vodka and balalaikas’ (and other klyukva objects), then the ‘net’ is not suitable for catching Kandinskys, Gumilevs or Tarkovskys. The grid spacing is too big and the latter kinds escape without being noticed. P.S. The short version of my first two posts in French available here: Introduction au plaisir de la klioukvification. “Tsarevna Lyagushka”, i.e. 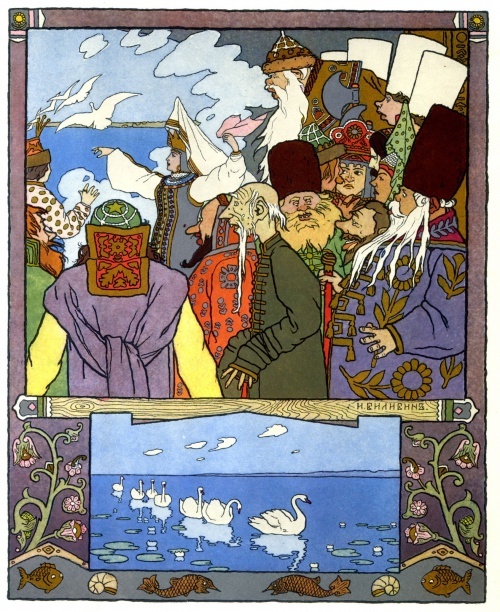 Tsarevna Frog is a Russian tale. You can watch the 1954 Soviet cartoon based on this Russian tale (with English subtitles). From “razvesistaya klyukva” (i.e. branchy cranberry). This word combination is sometimes attributed to Alexandre Dumas (père) but more likely it was first used in a 1910 Russian play mocking foreign stereotypes about Russia. It’s an oxymoron because a ‘branchy cranberry tree’ doesn’t exist. This resonates with a famous proverb (scratch a Russian and you will find a Tatar) which was attributed to Custine himself, Napoleon, Pushkin, etc. There is also “A Russian Journal” (1948) by John Steinbeck devoted to his travel to the USSR. The term “Unworld” comes from E. Cummings’ travelogue “EIMI“. To be more precise – director’s vision of a script (not to mention actors, producers, camera operators, etc.) based on translation(s) of an original Russian text. To paraphrase a well-known French saying: l’auteur est mortes, vive l’auteur! “”Лштшфум Ащьф” is “Kiniaev Foma” typed in Russian layout. “Rbybftd Ajvf” is “Киниаев Фома” (i.e. the name “Kiniaev Foma” typed in Cyrillic alphabet using sign-for-sign transliteration) typed in English layout. If you liked the content on Russian Universe, please support the project via: PayPal or Yandex.Money 410011569236991. Watch Live: Death as a Show! Thanks! Actually, my next post in the ‘Russian Stereotypes’ series will deal with portrayal of Russia(ns) in Western media (and the 2nd post on ‘Russophobia vs. Westernophobia’ will cover the so-called Westernophobia, Russian propaganda, anti-Western sentiment in Russia, etc). I don’t take this Russian stereotypes personally – cause it’s nothing personal, just business and/or propaganda. I don’t like such films (although fake Russian accent makes me laugh) not only because of the stereotypes they reinforce but due to the fact that it’s a ‘low genre’ (early Tarantino and his po-mo version of it is an exception to me). Surely there are many good old Hollywood or independent contemporary Western films. Speaking about Sochi, only time will tell what these games’ legacy will be in Russia. I don’t support hysteria (i.e. ‘Sochi Problems’ obsession) whether its Western, Russian or any other kind. I was very sceptical/critical before the games but now I root for the Russian team. P.S. I think Russians need new cultural identity which acknowledges Russian Europeanness without forgetting Russian cultural heritage. I see. Well, thanks for your answer and I’m really looking forward to your next post. Very comprehensive and interesting post – I enjoyed reading it, found it to be substantially accurate, and will add you to my blogroll! Thanks!